During the 1935-36 sports season, the Detroit Tigers won their first World Series, the Detroit Red Wings won their first NHL championship and the Detroit Lions won their first NFL championship. In 1936, Frank Fitzgerald, Governor of Michigan, and President Franklin D. Roosevelt proclaimed April 18 as “Champions Day” to celebrate the athletic achievements of Detroit’s sports teams and other hometown athletes. In 2012, Detroit Mayor Dave Bing rededicated April 18 as Champions Day at the Detroit Historical Museum and presented the Detroit Historical Society with a new proclamation. Pictured at left is the original plaque given to the city by President Roosevelt and signed by all Michigan Governors in 1936. 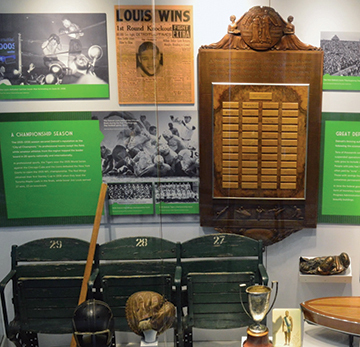 Celebrate this year’s Champions Day on Monday, April 18 at the Detroit Historical Museum from 6–8:30 p.m. Visit the Allesee Gallery of Culture to view the original City of Champions plaque as well as other artifacts from Detroit athletes of the 1930s. Charles Avison, author of Detroit: City of Champions, will speak about the history and significance of the day at 7 p.m. This event is free and open to the public! More information is here.